Here, have a cupcake! I've been blogging for 2 years now, off and on. Made some stuff, met some folks and generally just having a good time. 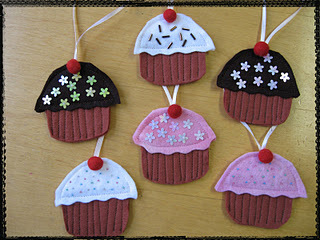 As a thank you to everyone who stops by to see what silliness I am up to, please leave me a comment and I'll draw a name on Friday and send you your very own wool felt cupcake ornie! Here are the wee houses I did as well. 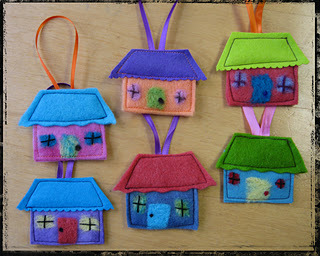 The doors and windows are needlefelted on. I needed an excuse to buy 2 new pairs of pinking shears (wave and scallop) and the felt is the perfect reason. I know you all want the details about Vegas. I will share some later, have to get the G rated pix off of hubby's camera first. November 28, 2007 by carol strand.